For a company that calls itself Coinsecure, this isn’t the best look. Indian bitcoin exchange Coinsecure has said that Rs. 20 crore of bitcoin have been stolen from its coffers. “We regret to inform you that our Bitcoin funds have been exposed and seem to have been siphoned out to an address that is outside our control,” Coinsecure said in a dramatic message posted on its website. Coinsecure is one of India’s most prominent cryptocurrency exchanges, and lets users buy and sell cryptocurrencies for Indian rupees. 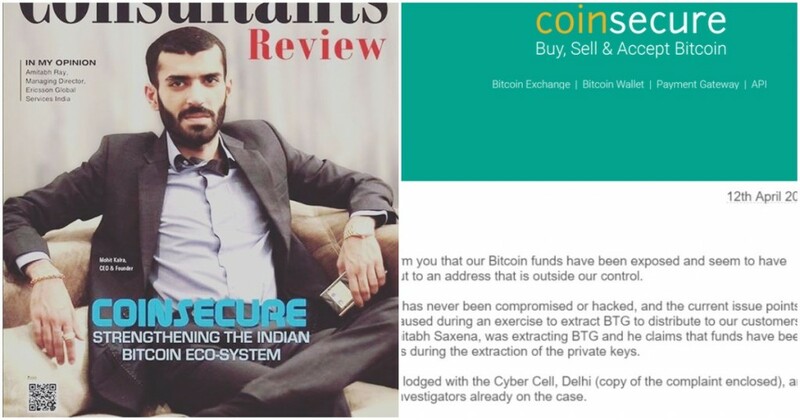 The circumstances around which the Bitcoin have allegedly been stolen sound fairly bizarre — Coinsecure’s CEO Mohit Kalra seems to imply that the company’s Chief Security Officer, Dr. Amitabh Saxena, might be responsible. “(Our CSO) was extracting BTG and he claims that funds have been lost in the process during the extraction of the private keys,” said Coinsecure’s statement. But in an FIR to the police, Mohit Kalra seems to more directly blame his CSO. “”We feel that he’s making a false story to divert our attention and he might have a role to play in the entire incident…his passport should be seized so that he can not fly out of they country,” says the FIR. The FIR adds that the CEO and the CSO were the only people in possession of the private keys which were required to access the bitcoin. It’s a pretty murky situation, with the CEO blaming his own CSO for stealing the company’s bitcoin. Hacks of exchanges are pretty common in the cryptocurrency world, and with many global companies including Mt. Gox and Yobit suffering from hacks in the past. But Coinsecure’s hack of 438 bitcoin, valued at over Rs. 19 crore, might be the biggest hack revealed in India yet. The hack is also comes at a pretty interesting time. Just last week, the Reserve Bank had banned banks from dealing with crypto exchanges such as Coinsecure, which had meant that their operations would’ve had to essentially shut down over the next three months. The RBI had said that cryptocurrencies were often used to fund illegal activities, the operations of crypto exchanges weren’t approved by any government body, and consumers were dealing with crypto exchanges at their own risk. The latest hack of Coinsecure shows that it might’ve just been right.